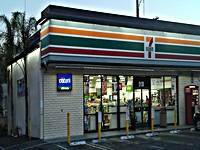 I was pretty intrigued by the idea of a 7-11 that carried a wide selection, especially after reading some of the names of the brews that were purchased here in the past. Sadly, the selection is absolutely nothing like what I saw in the website linked above. There was only one fridge with craft beers -- some of them Belgian ( tho mostly the standards found in Los Angeles such as Chimay and St. Bernardus 12), a handful of Stone IPAs, one or two from Avery and North Coast. Still ... pretty damn good for a 7-11 and an anomaly worth checking out. Being nearby in Alhambra, I had to make the drive to this oddball 7-Eleven. It's true folks, there's craft beer here, and some of it would even make beer geeks shiver. Setup like a typical 7-Eleven, lots of snack type food available, a soda fountain, lots of coolers for drinks, but only two of the coolers are dedicated to house craft beer. There are a few craft brands scattered around in the macro coolers. The good news is all the beer is kept cold. The bad news is Blind Pig IPA has 6 months of age on it, and some of the bottles have collected a little dust. For what it's worth, few of the beers are hoppy, so age should be less of a factor for most of the beers on sale. Oh, and the bottles are much more expensive than anywhere else. That's odd, because 7-Eleven tends to have decent prices on beer. Some of the beers available are worth coming here for, and they should be available longer than at other stores. Harviestoun Ola Dubh, Consecration, Westmalle, Red Poppy Ale & 2009 Angel's Share(! ), and one surprise you'll read about in the next sentence. Where else can I act like I'm 13 again and get a Big Bite hot dog, a Slurpee, and then throw in a $36 bottle of Cantillon Lou Pepe Kriek? I don't exactly know when it happened (I hadn't stopped by here in a few months) but this place got EXPENSIVE. When I first went about a year ago, it was basically on par with BevMo - some things were cheaper, some more expensive, but you basically came out even. Now, just about every 22 oz. brew is a minimum of $1 more expensive than Bevmo. The selection is still solid, though it skews heavily toward Belgians. I'd love to see some more IPA's and Double IPA's. Currently, the only double I saw was Green Flash. All in all, it's still a good place to pick up some craft beers, but only if you aren't willing to head up to Bevmo, Whole Foods, or even Trader Joes in Pasadena. This place is awesome. I stop by at least once every 2 weeks to pick something up. The people working are always friendly and helpful at recommending other beers. Its never that crowded and you can pick up a slurpee and some hot dogs at the same time! Last week they had 4 RR Supplication's, except now they are all sold. They have a couple Port Brewing 2nd Anniversary bottles, Ola Dubh 16 and 30, couple Hair of the Dogs, and others. Everything is always in coolers and its easy access off the 110. Recommend stopping by and picking something up.